Levi chose porridge as one of his Desert Island Dishes. He told us that his grandmother makes the best porridge and it's the dish that most reminds him of his childhood. He was born in Jamaica and lived there until the age of 11 and lots of his childhood sounded wonderfully idyllic growing up on the paradise island. He was raised by his grandparents after his parents moved to the UK and so it sounded a very natural choice to choose one of his grandmother's dishes in his selection. In Jamaica they make porridge out of lots of different things, from plantain to cornmeal and bananas. He grew up eating porridge, and interestingly in Jamaica, they eat porridge throughout the day, and actually tend to drink porridge more than eat it. This intrigued me so I did a bit of research, meaning, well, I Googled it. A traditional banana porridge would be made out of pureeing bananas and then warming this through in a pan to thicken it a little. So it's a little different to our notion of porridge over here in the UK, which I guess is traditionally the Scottish version of porridge, made using oats. I am a big fan of porridge. It makes the most satisfying breakfast and sort of sits in your stomach throughout the morning which sounds unpleasant but actually I find it reassuringly comforting. Porridge makes the most perfect Winter breakfast. My dad always used to make it for me when I was younger and he tended to make it with water and a pinch of salt. Perhaps to some people this sounds a little more like gruel, but I loved it. Then when I was older I added milk and my porridge world was transformed. It tasted so luxurious and creamy. I kept the pinch of salt from my dad's technique as I think there is very little that a pinch of salt can't improve. I used to make vats of porridge when I was cooking in lodges in Scotland and it's such an easy option when cooking for lots of people. You can get it going, and just keep feeding it milk as needed. It just gets creamier and creamier, and people will come in and demand to know if you added cream. Which you most likely haven't, although you should really try that one time as it's delicious. This banana porridge is very easy to make, and you simply add some chopped banana right at the end and stir through. Or you don't even have to do that, you can just have the caramelised bananas on the top. It's entirely up to you but I personally love the banana in the porridge. These caramelised bananas are one of my favourites. They went in my cookbook and I make them all the time. They are so quick and easy and yet they taste so good. Rice pudding is one of my favourite puddings, and one that I think is shunned socially to a large extent. Lord knows why because it ticks all of the boxes in my opinion. There is little better than a bowl of rich and creamy rice pudding with a dollop of jam. I'm making myself hungry just thinking of it. So I've added a dollop of jam to my porridge because it compliments all the other flavours beautifully. This porridge is a flavour bomb, it's incredibly good. Although it looks like a lot of things to add, I promise the combination of them all is remarkable and elevates this from simply another bowl of porridge to something that will have you bounding out of bed in the morning. Your family won't understand what has happened to you. For the porridge simply put the oats in a pan and add the milk and salt if using. Bring to the boil and then reduce to a gentle simmer. Simmer for about 5 -7 minutes until it looks thick and creamy but not like wallpaper paste. If at any point it looks too thick, just add more milk and give it a good stir. Keep doing this until it looks like how you want it. When it's ready stir in the chopped banana. Simple. For the caramelised bananas simply melt the butter, coconut oil and sugar in a frying pan. Add the sliced banana and fry for a minute or so until its' lovely and golden. Flip and fry the other side. I pop the chopped pecans into the banana pan once I've removed the bananas just to coat them in the delicious caramel. This is optional. 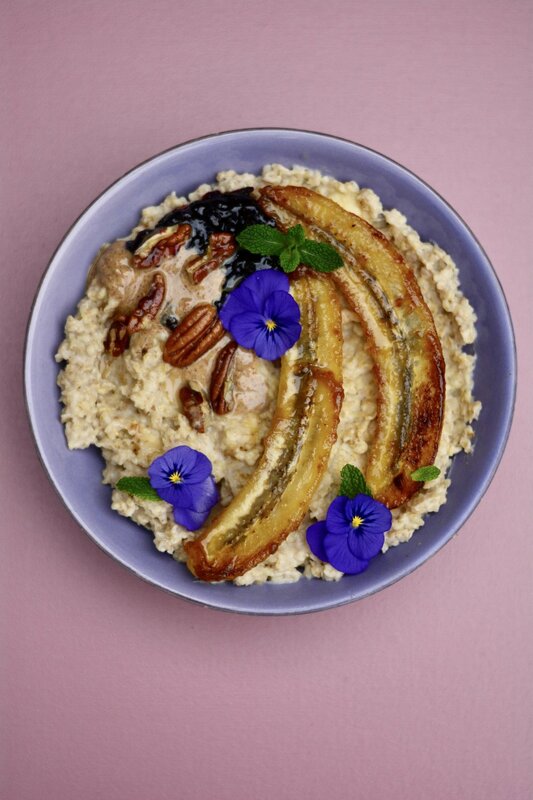 Scoop the porridge into bowls and add the caramelised bananas, the almond butter, the jam and scatter with the pecans. Yum.